Krishnan's blog: Is religion a vehicle to reach GOD? I could go on for ages articulating about this, but I am not going to do that now ,for the intention is not to debate but to shower some wisdom and enlighten some weak minds. People!this whole article may sound profane, but if you try to comprehend the inner sense of this article, may be you can understand why this topic has been chosen. First of all who or what is GOD? God according to my dictionary(knowledge) is someone or something that is omnipresent and omnipotent. Does he really exist? Well, that’s something beyond my ken and so in this article I presume he exists. Now looking at a larger picture, what is religion and how did it originate? 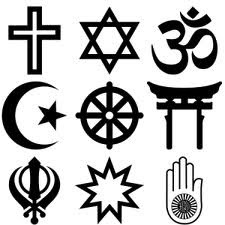 Religion is a cluster of beliefs and practices that connects mankind and GOD or rather humanity and spirituality. A religion is a repository of rules and regulations that one ought to follow in society so that he does not stray away from what is considered to be holy. I am pretty sure most of us believe in existence of only one GOD. If GOD is one why are religions so many? People can defend saying that different people follow different customs but ultimate end is GOD. If so, why do we fight in the name of religion? If GOD was one ,why do Hindus worship so many GODS? Think! Religion was formed so that people adhere to certain rules that will prevent them from being physically and morally reprehensible and the name “GOD” was framed so that we fear(out of respect) someone. Following your religion piously will only make you a good human being and will not take you to GOD. Rules permitted in one religion is prohibited in another for e.g. : polygamy is allowed in Islam where as it is prohibited in Hinduism. Drinking is allowed in Christianity whereas its an offense according to Islam. These were just rules that were formed by some unknown people so that they could do things that are deplorable in the name of spirituality. We all know GOD wouldn’t promote polygamy or Drinking be it in Islam, Hinduism or Christianity .This proves that GOD is not the one who brought religion in to existence, but it is we, mortals. Religion is just a depository of morally acceptable conventions and not a path that would take one to spirituality or GOD. The only thing religion has paved way is for communalism. People fight in the name of religion. No religion is superior or inferior and they are all the same(with flaws).Understand the real essence of religion. Mere espousing of your religion without understanding its real meaning is only going to takes you to ditches and graveyards. Then, what is the essence of religion? Religion is not a foolproof book for spirituality. It is prone to errors and some good points as well. Neglect the wrong and imbibe the good. What in religion will take us to GOD? Well, why should we worry about someone we haven’t seen. Worry about something that we can see. For e.g. : poverty .Service to mankind(poor and needy) is service to GOD. Why do we pray GOD ? ?Simple, to keep us happy throughout. Try doing service and you will relish a greater joy than what GOD can offer. Lastly, mere adherence to a religion and following your customs piously is not going to take you to GOD but it is service to mankind that is your eternal key to attain God.